These handle assemblies fit different applications. Please contact us to see if we have a model to fit your application. We have an adaptor/Pistol grip shifter to replace the factory handle in the car. Using our adaptor, your short throw shifter, will have a slightly shorter throw than the factory unit. When this adaptor is installed, you can install a Hurst E-body reproduction shifter. Handle comes with the original brown style grips. Other style grips are available with a slight increase in cost. See the plastic grip section under Shifter Parts. There is a $30 trade in credit towards any other style grip. $260 plus $14.50 shipping. (Cost of adaptor $100 , cost of shifter $160) If you have any questions about this or install instructions, call me for further info. The reproduction e-body shifter will fit the PT Cruiser with our adaptor. Shifter comes with the original style brown grips. 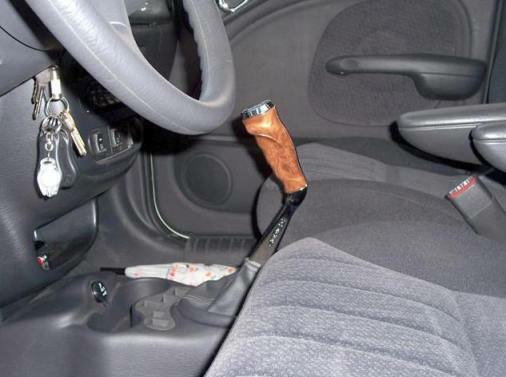 Other styles are available with a slight increase in cost.See the plastic grip section under Shifter Parts. There is a $30 trade in credit towards any other style grip. If you have any questions about this or install instructions, call me for further info. This is an easy 15 minute install into the shifter mechanism. Removing the console to get to the shifter mechanism can be more involved. See install photos for more details.